Nayeli quietly nods and smiles as a St. Vincent de Paul dental assistant explains what kind of treatment she will receive during her visit. When asked if she is nervous, she shakes her head no and says that she is happy to be here. Nayeli was only a few months pregnant last summer when she first heard about SVdP’s Dental Clinic. 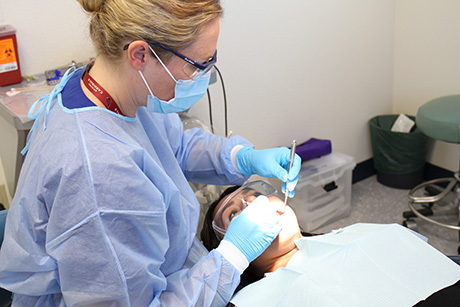 The low-income health program she was participating in sent her for a routine teeth cleaning at a different clinic, but found that much more work was needed. They referred her to SVdP. After arriving at the clinic three months pregnant, she was asked if she would like to participate in new initiative called “Healthy Mom Healthy Kiss.” This initiative, supported by Delta Dental of Arizona Foundation, seeks to impact the well-being of low-income pregnant women and their infants through increased access to dental care and education. According to Dr. Ken Snyder, SVdP dental clinic director, there’s evidence now that the bacteria that causes tooth decay is actually transferred from the mother’s mouth to the children. Children are then born with those bacteria. Or these bacteria can simply be transferred unbeknownst through a mother’s kiss. “The American Academy of Pediatric Dentristy wants every child to have a dental home before the age of one. Here at St. Vincent de Paul, through this program, children will actually have a dental home before they are born,” says Dr. Snyder. Nayeli shares that this will be her fourth child. Her other children are ages 3, 8 and 13. The Healthy Mom Healthy Kiss initiative not only aims to provide dental care to mothers, but also the education and instruction of home care. Once the baby is born, each mother participating in the program will receive instruction on how to care for their baby’s mouth, how to brush baby’s teeth and other helpful tips for good oral health, such not putting a child to bed with a bottle or not putting sugar on a pacifier. Mothers participating in the program will be asked to return with their new baby six months after the birth and a plan will be put in place for a dental or home visit by the child’s first birthday. Dr. Snyder is excited to see the results of this new initiative. Although still in its early stages, he has seen the mothers be very receptive of the program. On an average day, we serve about 200 walk-in guests, who need basic services ranging from showers and clothing to counseling and job referral. Your gift powers our programs as we provide vital support to those who are struggling.